Click Here to view the updated article at our new site, Land Transport Guru. The Bus Service Enhancement Programme, or BSEP for short, was launched on 7th March 2012. The Land Transport Authority (LTA), in partnership with Public Transport Operators (PTOs) SBS Transit and SMRT, rolled out new measures to significantly increase bus capacity and bus service levels. The BSEP is a continuation of the Quarterly Review of Bus Services which was initiated in June 2010. The $1.1 billion scheme will cover the purchase of 1000 new buses and 80 new bus services to be progressively introduced over the next five years. The first phase of the BSEP (comprising of 550 new buses and 40 new services) has been brought forward to end 2014. In March 2014, an expansion of the BSEP was announced, introducing 450 more buses from 2015 to 2017. This will bring the total number of government-funded buses to 1,000, and increase available resources for a new total of 80 new services. Most of the 40 expanded BSEP bus routes will be feeder or short trunk services to serve new areas of developments such as Sengkang, Punggol, Yishun and Choa Chu Kang. Since End December 2015, about 760 new buses have been pumped into service and 54 new bus services have been launched. With the full implementation of the expanded BSEP by 2017 and with help from private bus operators, the total capacity of the bus system will increase by about 35 per cent, or about 1,400 buses, in just five years since the start of BSEP in 2012. Under the revised BSEP, the Government will by providing funding for 550 new buses. Together with the 250 buses that the PTOs will add to their fleet at their cost, over the next 5 years, these 800 new buses will amount to a 20% increase in bus fleet. Out of 550 buses, 300 will be used to improve existing bus routes, and the remaining 250 used for operating new routes. The announcement of the expanded BSEP brought in 450 additional buses for a new total of 1,000 new buses. Buses purchased under the BSEP include Volvo B9TLs and Mercedes-Benz O530 Citaros for SBS Transit, as well as Alexander Dennis Enviro 500 and MAN NL323Fs for SMRT Buses. Under the BSEP, 95% of feeder bus services will run at scheduled intervals of 10 minutes or less during the peak periods. The remaining 5% will be scheduled to run within 15 minute intervals. This will be sustained over 2 hours during both the morning and evening peak periods. Currently, only 9 in 10 (90%) of feeder bus services are required to operate at 10 minute scheduled intervals or better, and for only 1 hour during each peak period. The PTOs will also have to improve bus frequencies across the board, i.e. feeders and trunk routes, during the peak periods. Today, all services must operate within 30-minute scheduled intervals, of which 80% must be within 10-min scheduled intervals. Under the BSEP, all services must operate within 20-minute scheduled intervals, of which 80% must be within 10-minute intervals and another 10% within 12-minute intervals. By end 2014, commuters can expect about 10% more capacity on buses along crowded stretches of bus routes during peak hours, as the PTOs will be required to reduce the loading levels for all basic bus services to 85%, down from today’s 95% of their licensed capacity. The revised BSEP adds part of the 1000 new buses to existing bus services which are in need of capacity upgrades. Most bus routes receive between one and three additional buses. The existing bus services excludes bus services launched under BSEP. While the focus in the initial years will be to improve bus service levels for existing bus services, commuters can also expect better connectivity in the bus network with around 80 new bus routes introduced progressively over the next 5 years. This is a 30% increase, up from the 261 basic bus routes today. Out of the 80 new bus routes, about 14 will be parallel bus routes that connect major HDB towns to the city area, making use of the expressways. The new parallel bus routes will be progressively introduced from the third quarter of 2012 to provide more options to commuters using stretches of the existing rail lines that experience persistent high ridership, while the ongoing rail enhancement measures are being implemented. LTA will monitor the performance of these parallel bus services closely and make adjustments where required. Besides improvements to public bus operators, the scheme also extends to private bus operators, in the hope of augmenting the resources of PTOs. City Direct Services and Peak Period Short Services (PPSS) are among such initiatives, and are explained in detail in the relevant articles. Buses acquired under the BSEP scheme have special registration numbers to separate them from the non-BSEP buses of similar models. They have similar specifications, however BSEP buses come equipped with passenger counters among other equipment, and can be directly monitored by LTA. In preparation for the transition to the Government Contracting Model (GCM), from late 2015 onwards, most BSEP Buses have been registered under the “SG” prefix. This is due to the GCM also comprising of BSEP buses. 25 Feb 2014: LTA calls for tender for six new Peak Period Short Services (‪‎PPSS‬) services to complement existing feeder bus services 265, 285, 811, 812, 903 and 913. Do note that new bus services (including City Direct services) and route extension to existing bus services count as BSEP services. Services not under the BSEP tally are supplementary services, such as Peak Period Short Services and others which duplicate sections of trunk routes. To promote new bus services, services with operation hours extension or route extensions to commuters, the Land Transport Authority prints BSEP Bus Hangers and distributes them to various bus on bus services around the area benefited by the new BSEP Bus Service. The first BSEP Bus hanger printed was for the route extension of Service 119, which was the first bus service to be improved under the BSEP scheme in Oct 2012, to Punggol and was released 3 days before the actual extension. 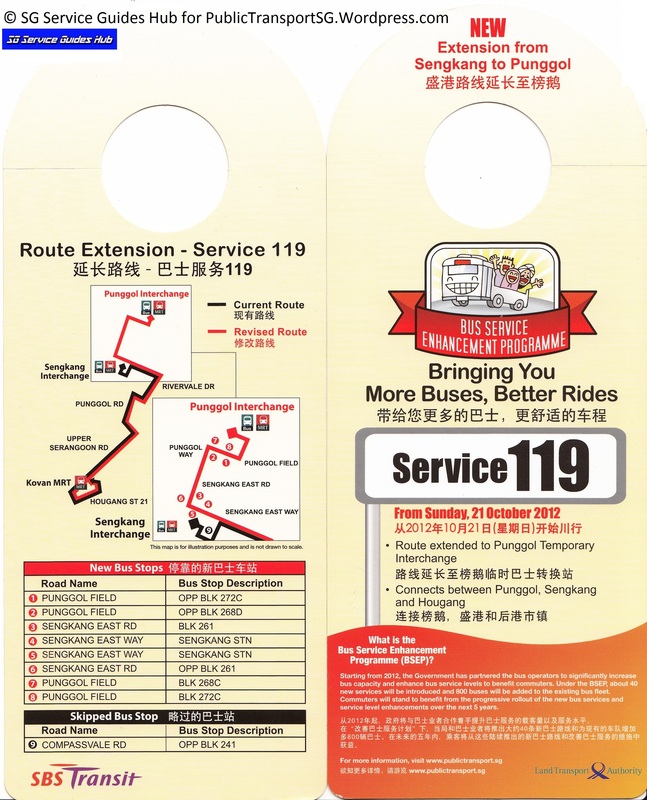 However, the Service 119 BSEP Hangers were only placed in Service 119 buses then. Subsequently, the second BSEP Bus Hanger was released for the then new Service 860. Since then, the printing of BSEP Bus Hangers for every new service under BSEP (Except City Direct & Peak Period Short Services) have been consistent. Is there any city direct service for woodlands ave 9’s residents soon? Hi, regarding the chronology of BSEP bus routes, I think only completely new bus services or significant route extensions are included under the route count. 658 should be #26, 11 should be #27, 659 should be #28 and 660 should be #29. PPSS and shortworking trips/ route variants like 143M, 123M and 859A/B don’t seem to be included, since their press releases don’t mention they are the XXXth new bus svc/route under BSEP. Hi,I would like to ask if it is possible for the goverment to build Beth berth for all Shortworking Trip bus services and special departure buses in the bus interchange in the future. I would like to ask why most of the bus service introduced under BSEP are loop route instead of bi-direction route (excluding city direct and express service). I would like to propose to add another bus service which links Paya Lebar MRT to Orchard/Suntec via Tanjong Katong Road to ECP. This is in view of the fact that with new shopping center (One KM) and Paya Lebar Hub, this additional bus service would provide convenience to many commuters travelling along that route. Currently, passengers from Paya Lebar or around Haig/Tanjong Katong Road have to transfer bus at Amber Road or Marine Parade Road in order to connect to another bus (Bus 36 or 48) to Suntec or Rochor Road respectively. Appreciate your kind attention. Thank you. How come I don’t see double deckers on smrt service 961?? Is there an error indicating that dd will be deployed on bus 961 as from 15th june? Yup there is 1 double decker on service 961. I suggest that 980 also deploy dd cos many foreigners take this bus daily n those single deckers are packed like sardines in a can. Can svce 167 also use few dd as there is high passenger demand during peak hours. as I live along sembawang area I sincerely hope to see more improvement on bus routes 167 & 980. SBS Transit Volvo B9TL Wright Eclipse Gemini 2 BSEP Batch 3 registrations from SBS3449X onwards will have Hanover EDS from 03rd August 2015, Monday of. Would you consider to add bus services to help people in Pasir Ris area to go to work to Changi Business Park? Especially around Pasir Ris Link road, where new condominiums are built, there’s no direct bus service there.